I would like to thank Toronto poet, jazz fan and jazz promoter Al Rose, for this very "apropos"
In the Shade of the Old Apple Tree; Blues for Wooden Joe. "Wolverton Mountain" is actually the second number on side two and not as shown on the cover. It is reversed with "In the Shade of the Old Apple Tree"
1965 Jazz Crusade issued LP # 1004 entitled: Traditional Jazz Around The World Vol 1 Of the selection of 10 tunes by various bands, two are by Toronto's Black Eagle Jazz Band, with Cliff Bastin (sic) on banjo and the same line-up as above, except that the bass player is Tom Duquette instead of Bill Weller. Tunes: Golden Leaf Strut; Blues for Papa John. 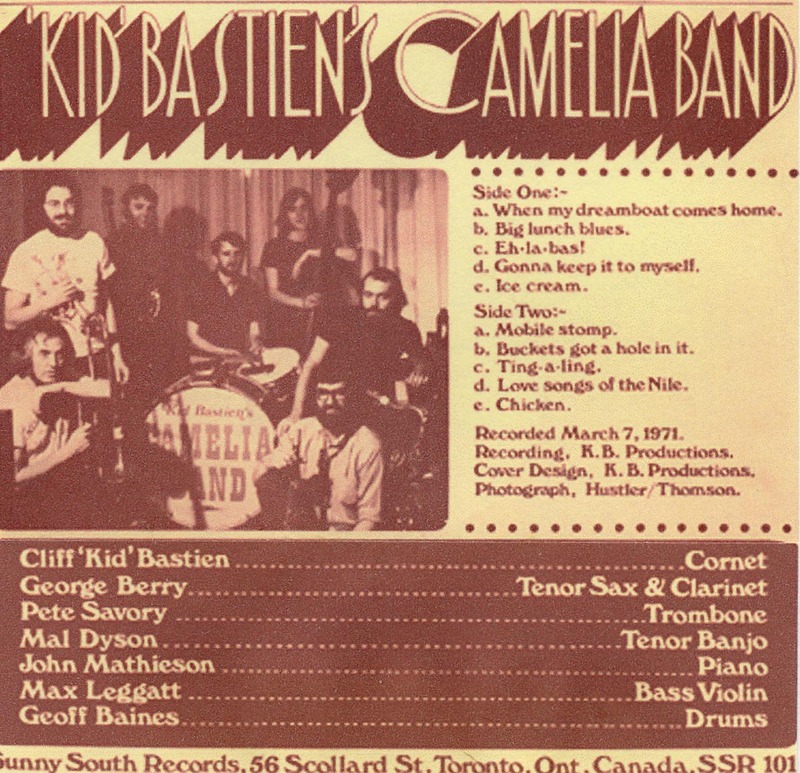 "Kid" Bastien's Camelia Band with Cliff "Kid" Bastien on cornet, George Berry - tenor sax & clarinet; Pete Savory - trombone; Mal Dyson - tenor banjo; John Mathieson - piano and Geoff Baines -drums; Max Leggatt -bass. Tunes: When my Dreamboat comes Home; Big Lunch Blues; Eh-La-bas! ; Gonna Keep It to Myself; Ice Cream; Mobile Stomp; Buckets Got A hole in It; Ting-a-ling; Love Songs of the Nile; Chicken. A feature of this Album is the sleeve note by Cliff Bastien, typed up on a beat-up old typewriter, the keys of which badly needed cleaning, I would say! His words are very interesting and tell us something about his jazz philosophy and his pride in achieving the standard of playing by the group on this recording, after only just over one year of rehearsals.Cliff (Kid) had only been playing cornet since 1969, having previously played banjo. Mal Dyson and Geoff Baines were not even jazz musicians when Cliff met them and taught them what to do. I can confirm that the standard the whole band reached on this album is remarkably good and it speaks volumes for the ability of Cliff Bastien to inspire and teach young would-be jazz musicians. This is something he did until the day he died. The turning point for the band (Cliff writes) was May 1970, when the band got a regular gig at Grossmans Tavern on Spadina Avenue, Toronto. They played Saturdays from 3-6 pm and 8-11 pm. This is an excellent recording. The highlight for me was George Berry's tenor sax solo on Ice Cream. George does a fabulous job of re-creating Captain John Handys famous alto sax solo choruses and he shines all the way through. "NEW ORLEANS JAZZ is a music of no particular time or place, it can be played by any dedicated musician with the desire to do so. It has long been my aim to recapture the sound and atmosphere of New Orleans Jazz, yet at the same time giving musicians a feeling of creativeness so necessary in this mode of jazz. This record shows my endeavour to interpret this basic jazz formula. It shows how Mal Dyson - banjo; Max Leggatt - bass; Geoff Baines - drums provide the steady four beat rhythm so essential to this style of music. John Matheson - piano, while working in this four beat rhythm, also supplies a strong link with the front line ensemble. In the front line we have Pete Savory, whose playing is a fine example of "tailgate" and plays his trombone part with sincerity. George Berry, on tenor sax and clarinet, plays with inspired beauty throughout. The recording conditions are worthy of note. The record was made on a home recorder in the front living room of Mrs Warren, on Cottingham St., on a cold and windy Sunday afternoon. Most of the numbers were put down in one take. A couple of cases of beer provided the atmosphere. The tunes are a cross-section of New Orleans numbers, blues, folk songs, spirituals and standard pop songs. A SHORT HISTORT OF THE BAND.... This band was formed just over one year ago (i.e. 1970) and most of the musicians had little or no experience whatsoever. Mal Dyson and Geoff Baines were local jazz fans, but not musicians. when I met up with them in the Fall of 1969. I had been fooling around on cornet for about five months at this time, and was very keen to get a little band going for fun. I had played banjo for a term with the short-lived Magnolia Jazz Band. The most important musician to emerge from that band was bassist Max Leggatt, who at the time was only 18 and had just switched from amplified bass in a rock group, to play New Orleans jazz. Upon hearing the Kid Thomas band on a trip to Mendota, Minneapolis, we both had a burning desire to form an authentic as possible New Orleans band. We gave Mal and Geoff a few lessons, and got down to rehearsing two nights a week in Geoff’s front bedroom. Both worked bloody hard, and right now I would go out on a limb and say they’re as good as anybody around today on their respective instruments. During this time Max really started to get the slapped bass style and since then has steadily improved to a point where he is ranked alongside the very best New Orleans bassists. After three months, two very experienced new Orleans style jazzmen from England were persuaded to join us – George Berry and Pete Savory. We went along with this line-up of six pieces until January 1971, when John Matheson joined us on piano. He had been a fan of the band for several months and had never heard music like we played before. Since that time he’s purchased a piano, practiced hard and, low and behold, we have a great New Orleans style piano player. The turning point for the band was last May 1970, when Al Grossman, the owner of a small downtown bistro (Grossman’s Tavern) hired the band on a regular basis. Every Saturday, 3-6 pm and 8-11 pm. The fans came out and a great bunch of waiters were sympathetic to our musical ideals. They gave us an enormous amount of help and inspiration. This then is an introduction, but by no means the end. We hope there will be other recordings and that the band improves with age like fine wine. Comparison between this album and any other are absolutely superfluous, because this IS “New Orleans Jazz” believe me! Our thanks to Dave Hustler, Warren Thomson, “banjo” Bob Boyle, Karin and Mrs Warren for making this record possible, also Suzanne and Diane who made their apartment available for the band to practice in. Cliff “Kid” Bastien, March 1971. December 12 1971 Toronto. Sunny South Records LP SSR102 George Berry Plays New Orleans. While Kid Bastien produced this LP on his own label, he does NOT perform on it. I do not presently have a copy of this album. Fat Cats Jazz LP #131. Recorded at the 7th Manassas Jazz Festival, in Virginia. Cliff "Kid" Bastien is on cornet, which he had been playing for just three years. The late Brian Williams is on clarinet - a stunning player in the George Lewis mould. Brian died at the early age of 50, after a heart attack. . Pete Savory is on trombone and he plays the Big Jim licks on Ice Cream to perfection. The rest of the band was Bob Boyle -banjo; Dennis Elder - drums; John Mathieson - piano and Jimmy Jones - string bass. Tunes: Ice Cream; Does Jesus Care? ; Short Dress Girl; When your hair has turned to Silver; down by the Riverside; See My Milk Cow Blues; Kid Thomas Boogie Woogie; Burgundy Street Blues; Rip Em up Joe; Algiers Strut. This is another excellent session - the front line were in their prime and the rhythm section is lively, with drummer Dennis Elder leading the way. 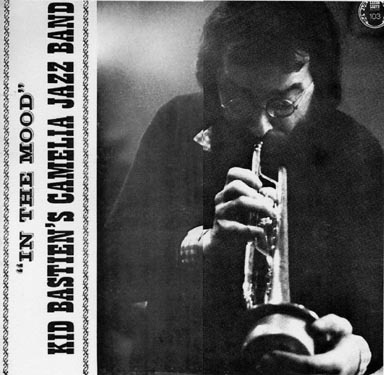 Kid Bastien's Camelia Jazz Band "In The Mood"
Cliff is playing trumpet; George Berry tenor sax; Sven Stahlburg - drums; Peter Ness - string bass; John Quinn - banjo; John Hiscott -piano; Pete Savory - trombone. Sven comes from Sweden and was evidently on vacation in Toronto. Tunes; Sil Vous Plait; I Love You So Much it hurts Me; Girl of my Dreams; Waltz you saved for Me; Kid Thomas Boogie Woogie; Just A Closer Walk With Thee; Four Leaf Clover; In the Mood. Another very good session. The band is mature and relaxed - once again George Berry gives a stand-out performance.. It could not have been too long after this that George Berry returned to England. It must have been a sad blow for Cliff and the band members. The band evidently folded soon after George left. The band wanted the Artesian Hall sound for this recording, I guess and they got it - lots of echo! This really favours the clarinet, trumpet, banjo & drums but does not help trombone etc. This band name - The Louisiana Joymakers - is the name that I inherited, when Pete Savory got his green card and left for the USA, to end up in New Orleans, thereby fulfilling a life-long ambition!. I still have the band sign, drawn by signwriter Cliff Bastien, in my garage! I transcribed this to a personal CD btcd4012 but it has not been commercially issued. New Orleans revival styled jazz, well played, with authentic sounding Artisian Hall acoustics which I enjoyed but may not be everyone's cup of tea. Cliff Kid Bastien trumpet; Patrick Tevlin -tenor sax; Roberta Tevlin trombone; Chuck Clarke -drums. Jack King - banjo; Rainer Hunck - string bass and Stephen Brown -piano. Some background information which may be of interest to jazz historians. Cliff Kid Bastien left the Louisiana Joymakers in March 1978. That band had been offered a six gigs a week contract at the Park Plaza Hotel, including a Saturday matinee and this was too much playing for Cliff, at that time, remember he ran his own very successful sign-writing business. For a short period there was no jazz at Grossmans Tavern and I stepped in to fill the vacuum in November 1979, leading a short-lived Saturday matinee band called Kilroys Jazz Aces we made $25 a performance! It was a six month spell from November 3/79 to May 10/80. At that time I left the Grossmans gig to concentrate on the Louisiana Joymakers, which was playing Friday and Saturdays at Jakes Boathouse in Brampton. ($50!) Pete Savory had given up that band in February to move to the USA and the guys invited me to take his place! Cliff returned to Grossmans Tavern with a new band in May 1980 or soon after. Cassette tape - Tapeworm # 1 Sunny South Records. This is a clarinet trio with Cliff on banjo, Colin Bray on bass and the very versatile Patrick Tevlin on clarinet. Titles: St. Philip St. Breakdown; Only a Look; White Cliffs of Dover; Avalon,;Does Jesus Care; Bright Star; Over The Waves; When The Birds Play Peekaboo; The Old Rugged Cross; Where The River Shannon Flows; Melancholy. Colin Bray had joined the Happy Pals in mid-November 1985 and this was his first band. He played regularly with them until around March 1989. Colin had been shown the rudiments of bass playing by (no prizes for guessing who) Cliff Kid Bastien! Cliff encouraged and guided many talented initiates in playing the New Orleans style, on most of the instruments too. He did this regularly over the years and was blessed with the ability to convey his happiness and enthusiasm, thereby inspiring people. His pupils invariably benefited from his example and guidance. Cassette tape - Tapeworm # 2 Sunny South Records. Cliff Bastien trumpet; Norrie Cox clarinet; Patrick Tevlin tenor sax; Roberta Tevlin trombone; Colin Bray string bass; Elizabeth Brown banjo; Chuck Clarke drums. 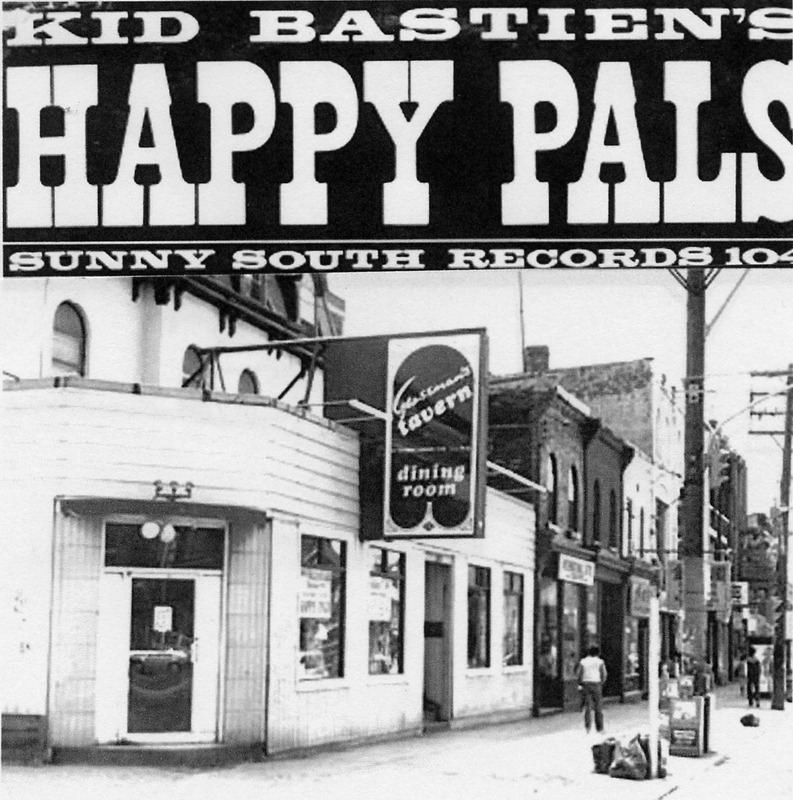 Kid Bastien's Happy Pals - "Live At The Canoe Club. Recorded at the Toronto Sailing & Canoe Club. Tunes You Tell Me Your Dreams; Willie The Weeper; Roll Along Kentucky Moon; Algiers Strut; Ole Miss; The Laughing Samba; Exactly Like You; When We Danced at the Mardis Gras; I Dont Want to set the World on Fire; The Old Spinning Wheel In the Parlour; Lily of the Valley. 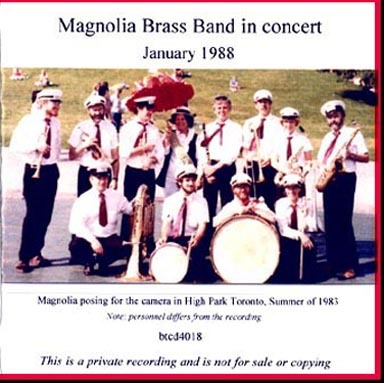 It was not until June 6 2002 that I transcribed this radio broadcast on to a private CD (btcd4018) of the Magnolia Brass Band. This was the marching band led by Kid Bastien. It has not been commercially issued, but it was digitally recorded for a radio broadcast in Toronto and the quality is good. Trumpets - Cliff Bastien & Don Chapman; trombones - Roberta Tevlin & Brian Towers; alto sax - Janet Shaw; tenor sax - Brian Ogilvie; clarinet - Patrick Tevlin; bass drum - Chuck Clarke; snare drum - Phil Pie; tuba - Dave Maynard; Parade Marshall - Noonie Shears. Tunes: Victory Walk (Joe Averys piece); If I Ever Cease To Love; Just A Closer Walk With Thee; Over in the Gloryland; Panama; Salutation March; Whoopin Blues; In the Upper Garden; Bugle Boy March; You Are My Sunshine/the Saints. A rare opportunity to hear a New Orleans styled brass band playing indoors with fine recording conditions, with multiple mikes and digitally mastered. The band sounds really authentic. The numbers are well-rehearsed and are well played. Maybe I should not say that, as I happen to be in the line-up! Tunes: Smile Darn Ya Smile; If You See My Saviour; I Had Someone else Before I had You; Yearning; Mexicali Rose; Tuck Me to Sleep; Broken Promises; Je Vous Aime; Right or Wrong; Till Then; How About You; Old Grey Bonnet; Down By The Old Mill Stream; I Cant Escape From You. A good blend of tunes and pleasant listening. While nothing really takes off in the manner of the earlier recordings, Cliff plays tasteful and restrained trumpet and sings some fine vocals. Lots of fine, careful solos from all the star players in the group. While George Bucks liner states the recording was in April 1990, I am certain it was actually done in May. 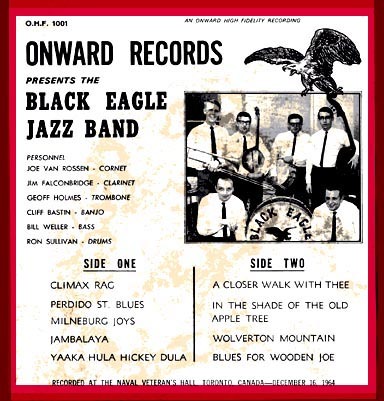 That was the year Cliff Bastien and Chuck Clarke (drums) played with the Hot Five Jazzmakers and we were down for the Jazz & Heritage Festival with a party of over 60. The band performed at Fritzels Bar and the Inn on Bourbon etc. It was a six day tour, arriving May 2nd 1990 and leaving on Monday May 7th. I believe the GBH CD was recorded sometime during this period. Swedish Discographer Björn Bärnheim has recently shown the recording date to be May 6 1990. This is a much more likely date. 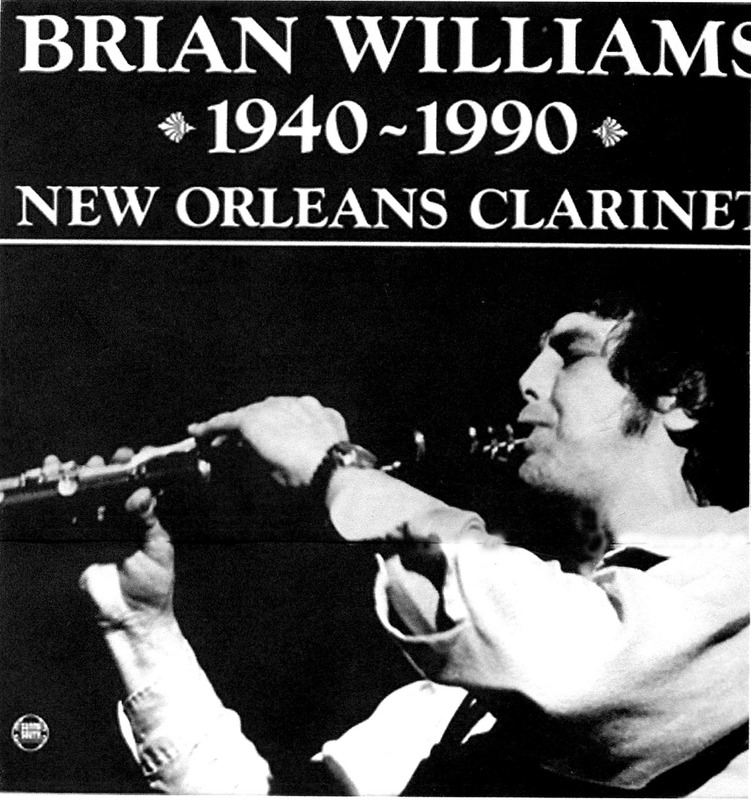 This is a mixed group of recordings which Cliff Bastien issued to commemorate the excellent clarinet player Brian Williams, whose untimely death in 1990 was a sad loss to the Toronto jazz fraternity. Cliff takes part in just four of the ten tracks. He is on banjo on three tracks and trumpet on one track. While the record was not issued until 1991, the material covers a period from 1968 to 1984. There is an excellent and very moving sleeve tribute by Don Chapman, who played trumpet in the Silverleaf Jazz Band with Brian for several years. A fitting tribute to a fine clarinet player. A few new copies of this LP are still available. "Live at Grossman's" Produced by David Goldberg. This is stated to be a 25 year anniversary of the band at Grossman's Tavern, which is probably incorrect (assuming one accepts the notes on album SSR101) but who cares? it will give the historians something over which to puzzle in years to come! Cliff 'Kid" Bastien - trumpet; Patrick Tevlin - tenor sax; Roberta Tevlin - trombone; Roberta Hunt - piano; Len Samuels - banjo; Jimmy Jones - string bass; Chuck Clarke - drums. Tunes: Jamabalaya; Sing On; Sammy's Blues; Kats got Kittens; In the Upper Garden; Please Don't Talk About Me When I'm Gone; Sail Along Silvery Moon; Cest Magnifique; Blue & Broken Hearted; Laissez les Bon Temps Roulez! This CD was re-issued in Denmark in November 2002 as Music Mecca CD 4004-2 for the purpose of Cliff Bastien's tour of Denmark and Sweden. Around 100 were sold. The band has further matured since their fine 1984 LP. This is the band's first recording on compact disk. It is a lively, stomping, affair which really captures the atmosphere of the band in the ambiance of Grossman's tavern perfectly. The Kid singing "Kats Got Kittens" highlights Cliff's sense of fun, which he conveyed so easily to his audiences. "Laissez Les Bons Temps Roulez" summarises the approach of Cliff and the band - swinging like the proverbial clappers! A very entertaining and lively recording which does justice to this gifted group. Copies of this CD are still available. A Music Mecca CD 4024-2. Recorded at the SeaSide Jazzklub, Frederikssund, Denmark. "New Orleans Delight" is one of the finest European bands presently playing in the New Orleans revival style. Cliff "Kid" Bastien - trumpet and George Berry - tenor sax are the featured guests. The regular members are Kjeld Brand - clarinet and leader; Bengt Hansson - trombone; Goran Magnusson - piano; Erling Lindhardt - banjo; Stefan Karfve - string bass; Claus Lindhardt - drums. Joe Avery's Piece/Dippermouth Medley; A Thousand Goodnights. This is a very significant recording for everyone and especially for myself personally. The Wednesday before Cliff died, I was with him in his workshop - we were talking about our forthcoming joint trip to NOLA with a band, for the French Quarter Festival. Cliff had just received a demo copy of this CD and he wanted to know if I thought he should allow the Danish guys to release it. Incredibly, he was actually doubtful about it - he wanted some re-assurance! He played it for me. After hearing only the first track "Algiers Strut" I let him know I thought it was excellent and that it would be a crime not to issue it. Mind you, I am sure wiser heads would have prevailed, even if I had not spoken up for it! A little over two months after this session, Kid Bastien was no longer with us and it was a big shock and trauma for us all. 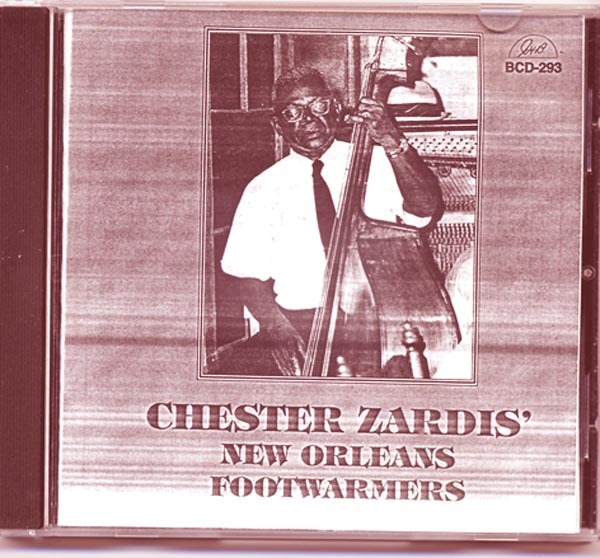 His friends and fans of New Orleans styled jazz everywhere, will be very thankful this recording was issued. It is an important part of his legacy. It has all the excitement that one expects of a live session. Cliff and George are musically re-united after many years and New Orleans Delight is an exceptional band in this style. Also it is very well recorded. It also happens to be the most attractively packaged CD production I have ever seen and I am not saying this just because I made a very modest contribution to the liner notes! 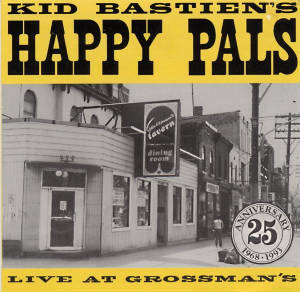 If you are a fan of "Kid" Bastien, you will need to have this CD in your collection. Church Concerts 2001-2002 Volume 3. Recorded at the Sorgenfri Kirke, Denmark and produced by Christian Westergaard. 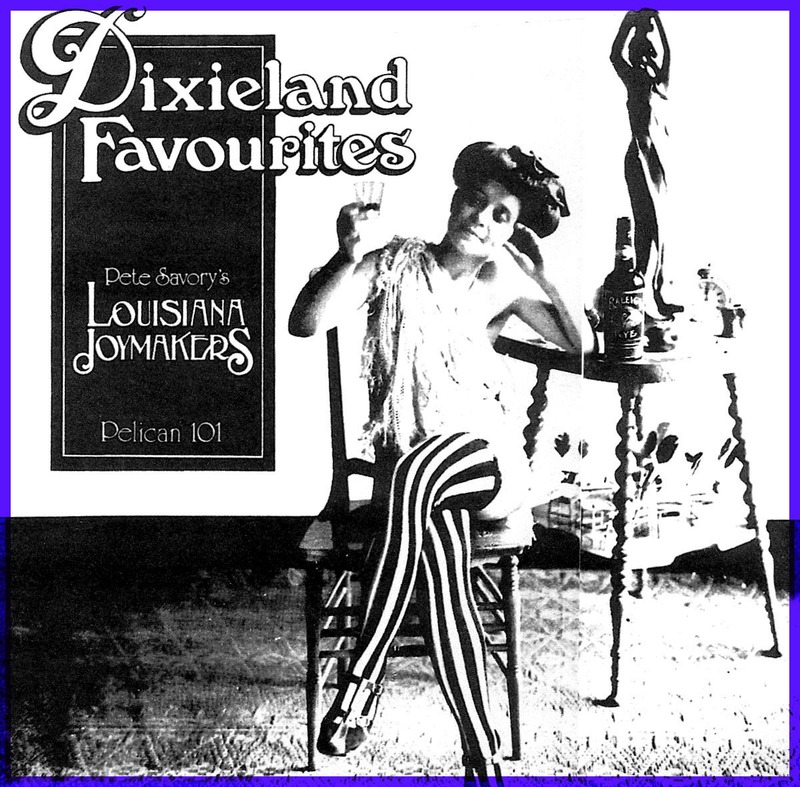 "New Orleans Delight" with Cliff "Kid Bastien & George Berry appear on 4 of the 14 tracks on this CD. The line-up is the same as 4024-2. The 4 tunes: San Antonio Rose; Jesus Is Calling; Rivers of Babylon; Highways are Happy Ways. There is some title duplication with the other CD, though it is a different session. The lovely hymn "Jesus is Calling" is a stand-out. Cliff sings it in an emotionally touching manner, which left me wondering if he had a presentiment of the future and his own passing. The National Film Board of Canada financed a 45 minute film in 1972 for a couple of artists. This is a glorified home movie about a couple of artists but there is a precious 71 second clip from Grossman's Tavern in December 1971 where a youthful and vibrant Cliff Bastien appears with his Camelia Band. He sings "Eh La Bas!" Happy days indeed! Also seen are: George Berry - tenor sax; Peter Savory trombone; Max Leggatt string bass. Banjo is obscured but it is Mal Dyson. One of the two artists in the film, Robert Rayner, sits in on drums in the clip. Can be bought on line from the NFB web site but only 71 seconds of it will be of interest to most jazz fans. Max Leggatt, the bass player, tells me that the waiter from those days, name of Rocky, can be seen and also the original owner of Grossman's - Al Grossman makes an appearance. Max and I have figured that it was probably filmed in late 1971, as the pianist, who joined the band in January 1972, is not in the video. Nov 28 2002 Cliff Bastien & George Berry Radio interview at Radio Jazz Copenhagen. Fascinating discussion with Cliff and George. Cliff tells the story of how he became involved with jazz. I have a CD transcription from the radio broadcast. An interview took place at Grossman's Tavern between Jim Hiscott and Cliff "Kid" Bastien. It was designed for radio and includes the playing of various jazz selections. Cliff talks about his introduction to jazz; about going to New Orleans; about meeting Kid Thomas Valentine and so on. The Interviewer, Jim Hiscott, played piano with Cliff in the Camelia Jazz Band in the 1970's and is present on the September 1975 recording. I have a CD transcription of this interview. I have had lots of help from many people in putting this together and lots of encouragement. In particular I would like to thank our friends in Scandinavia and also Bill Winters. Bill inherited Cliff's record collection and kindly allowed me access to those albums I did not have. I am very grateful to everyone. It started out for me as a listing of Cliff's recording releases but turned into a major exercise and a real learning experience! No doubt there are still errors and omissions and there will be further additions. I have tried to include all the Kid's publically issued recordings. I have not included the many casual and impromptu recordings made by people over the years. There are many in existence and some are quite good but to try to list them all would be an impossible task. There are also some professionally recorded sessions which were rejected or moth-balled at the time of recording which may find their way into issuance in the future. It is beyond the scope of my project to get into details about those items. My purpose has been to try and tell a part of Cliff's story by using his issued recordings as guidelines. Getting to know Cliff, watching him in action and seeing his impact upon others has been a fascinating experience for me, since I first met him in the late 1970's. I was fortunate indeed to have enjoyed his friendship and I admired his approach to jazz. He certainly made the lives of many people richer, by his skills and showmanship. He gave of himself unstintingly in his efforts to entertain his audiences. He was the perfect guide and mentor for any young musicians with the desire to better understand and perform the "Real Jazz"
Cliff always wanted to be buried in New Orleans and his adopted daughter and executor, Rasha Sutton fulfilled this wish for him. Cliff’s ashes are located in the Metairie Cemetery. This is a very large, active cemetery between the City of NOLA and the airport. The municipal address is Lake Lawn Metairie Funeral Home and Cemeteries”. 5100 Pontchartrain Boulevard. “ The ashes are located in a bench in section 31, lot DD of Metairie Cemetery. 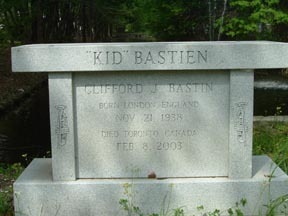 The name on the bench is “Kid Bastien” (i.e., where you would normally find the family name) and Cliff’s name (Clifford J. Bastin) is written in the inscription. Here is a photo. Since his death in 2003, his friends and admirers have been celebrating his life. 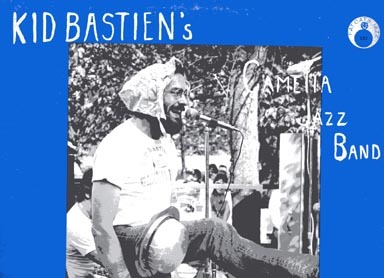 "The Kid Bastien Remembered International Jazz Band' was formed in his memory for the French Quarter Festivals of 2003; 2004; 2005; 2006; 2007 and 2008. This is a band of international musicians who were friends or admirers of "KB". Also Patrick Tevlin, who took over the leadership of the "Happy Pals" after "KB's" death, has staged a popular and very successful annual jazz party every year, (on the anniversary of his death) at "KB's" beloved Grossman's Tavern.